Population: 32.0 million (est.) - immigrants make up more than 30% of the total population. The on-going political turmoil in the Middle East is a challenge for the Saudi rulers, with major security problems due to the current situation in neighbouring Iraq and Yemen. Saudi Arabia feels increasingly challenged by growing Iranian influence, its traditional rival for hegemony in the Gulf region. Therefore, Saudi foreign policy has turned to become more assertive, mainly in order to counter Iranian influence, e.g. by supporting oppositional (Sunni) forces in Syria and, since March 2015, by a direct military intervention in Yemen against the advancing Houthi rebels, who as a Shia tribe are allegedly backed by Iran. Domestically, political and social reforms are expected to remain cosmetic, as the ruling Saud family and the clerical establishment will remain in firm control. Saudi Arabia has an oil-dependent economy with strong government controls over all major economic activities. 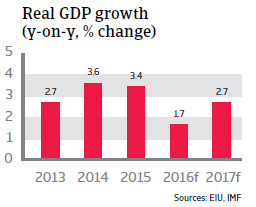 Economic growth has been negatively affected by decreased oil prices, and GDP growth is expected to slow down to 1.7% in 2016 following growth of 3.4% in 2015. 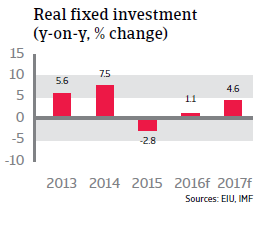 Support for economic activity comes from on-going large investments in infrastructure (metro Riyadh) and new industrial projects (e.g. Sadara petrochemicals complex). The banking sector is still sound, but the lower oil price has affected the financial sector through tighter liquidity. Credit growth has decelerated and balance sheets have deteriorated somewhat. Given that oil accounts for 80% of government revenues, it comes as no surprise that the decline in the price of oil has a large negative impact on public finances. 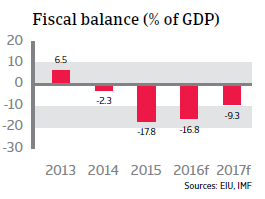 In 2015 the budget deficit increased to nearly 18% of GDP, while the expected decrease to a GDP deficit of 9% in 2017 is mainly due to austerity measures. Petrol prices have been sharply increased and subsidies on electricity, water and fuel for the wealthy Saudis have been reduced, while privatisations are planned and capital spending will be cut. The current account turned from high surpluses in previous years to a 5.4% deficit in 2015, and in 2016 another deficit of 9.3% is expected. That said, due to its very large international reserves and low public debt (14.7% of GDP in 2015), Saudi Arabia is able to easily fund those deficits. 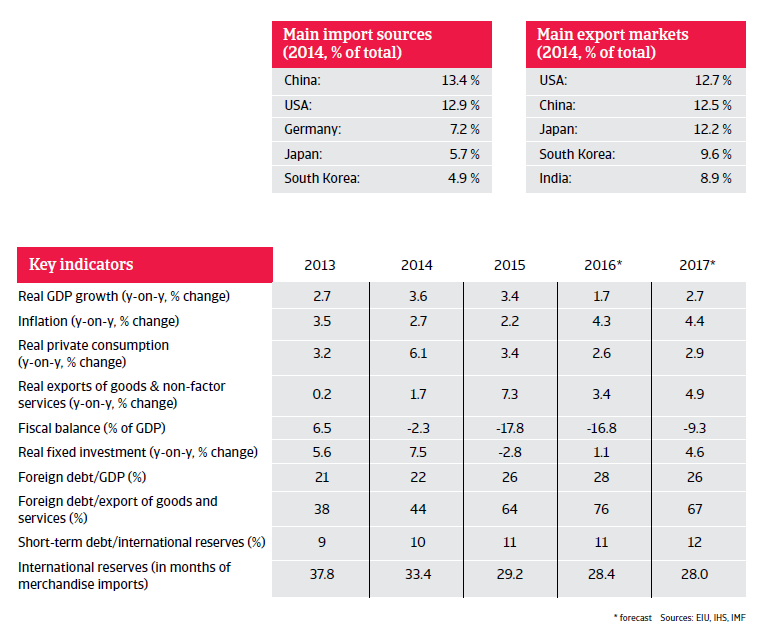 Import cover amounts to almost 30 months in 2016. The external financing requirement is only 15% of foreign reserves in 2016. 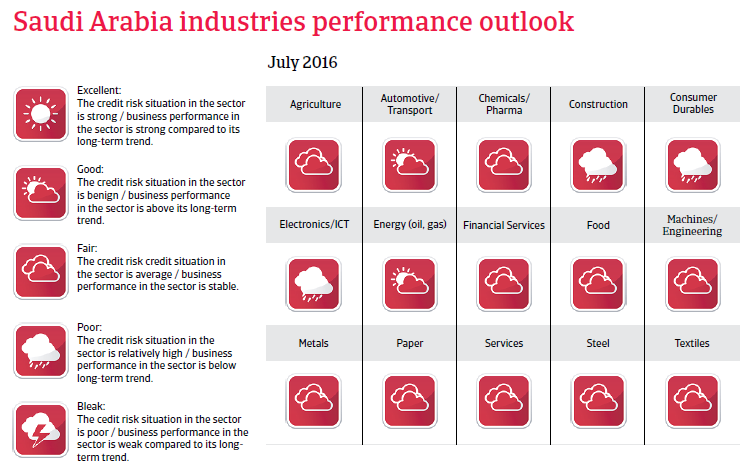 While Saudi Arabia is able to sustain high spending for some years, a structural shift to a long-term period of lower oil prices would at last pose a risk for the economy. A comprehensive diversification of the economy away from oil dependency is high on the political agenda. Every year many young Saudis enter the workforce, while the economy does not generate enough jobs to absorb population growth.